Big Island Interscholastic Federation track & field athletes left their mark at the Hawaii High School Athletic Association preliminaries held at Kamehameha-Oahu on Friday. BIIF athletes made the championship finals, to be held Saturday, in 22 different events as the top eight competitors in each event advanced. Kau’s Jacob Edwards demonstrated why he is the state champion in both the 110 and 300 hurdles by taking both events in convincing fashion. 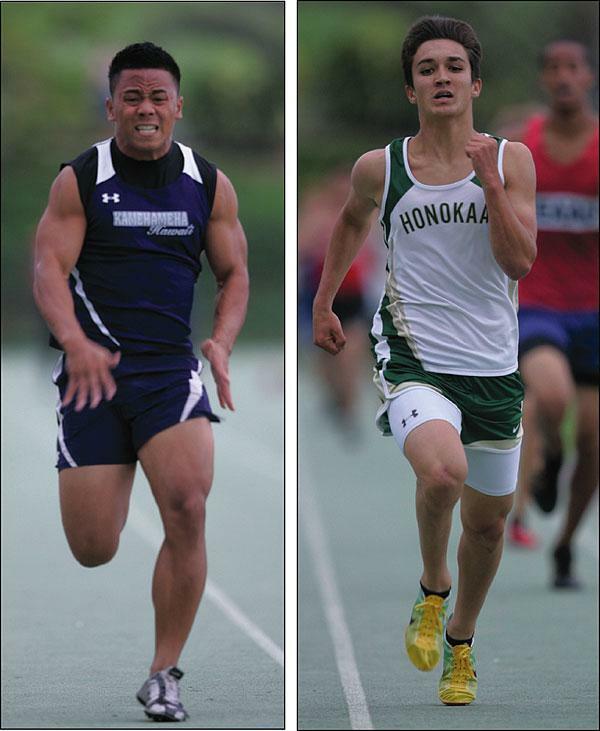 KS-Hawaii standout Francis Blas III will be joining Edwards in the finals of the 110 (No. 4) and 300 (No. 3) with Warrior teammate Everett McKee also making the 300 (No. 6) hurdles event. In the triple jump Edwards made the furthest distance and will be seeded No. 1 going into the finals along with KS-Hawaii’s Manta Dirks seeded No. 7. Edwards also made the finals of the long jump (No. 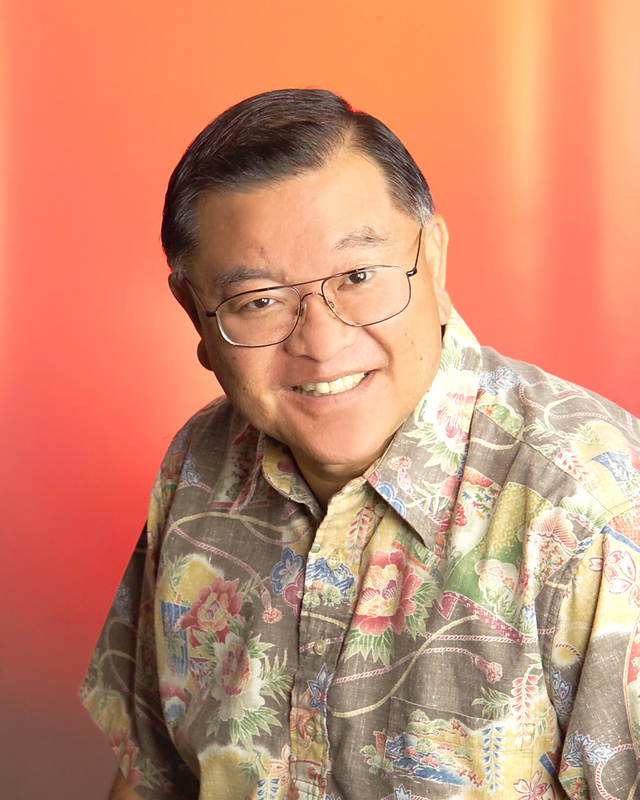 6) and is joined by KS-Hawaii jumpers Kaenan Akau (No. 4) and Dirks (No. 5). 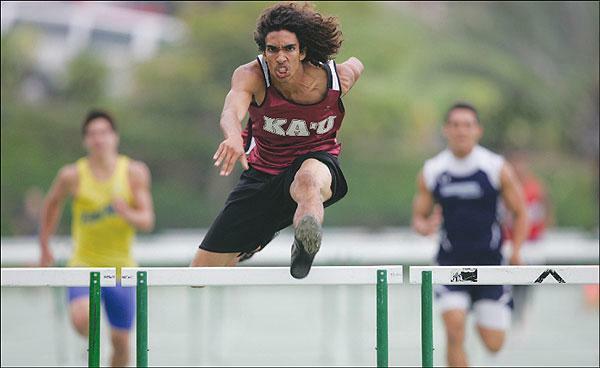 Hawaii Repertory’s Ku’uipo Nakoa had the second fastest prelim time in the 100 and 300 meter hurdles and in the second best long jump distance, with Kahuku’s Zhane Santiago edging Nakoa out in each of those events during day one of the championships. 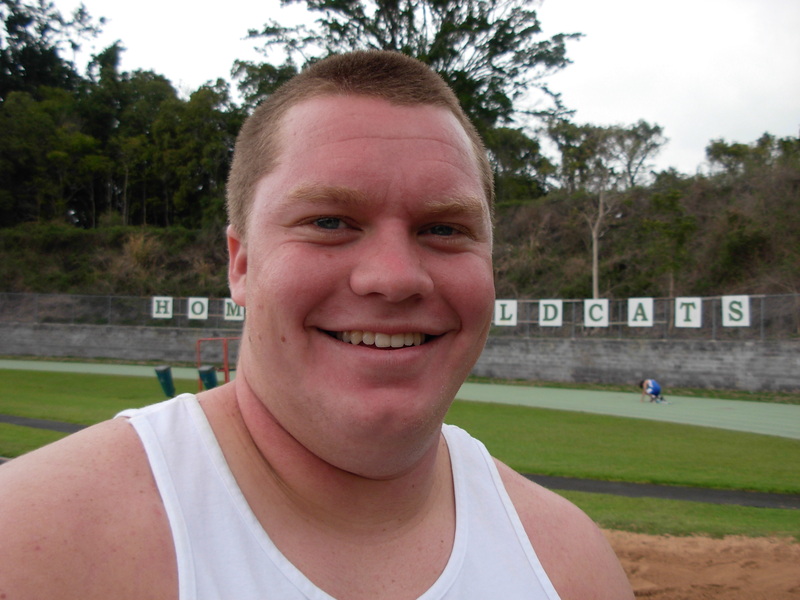 HPA big man, Shane Brostek, qualified for Saturday in the shot put (No. 3) along with Kamehameha’s David Kekuewa (#8). Brostek also made it into the finals of the discus (No. 7). 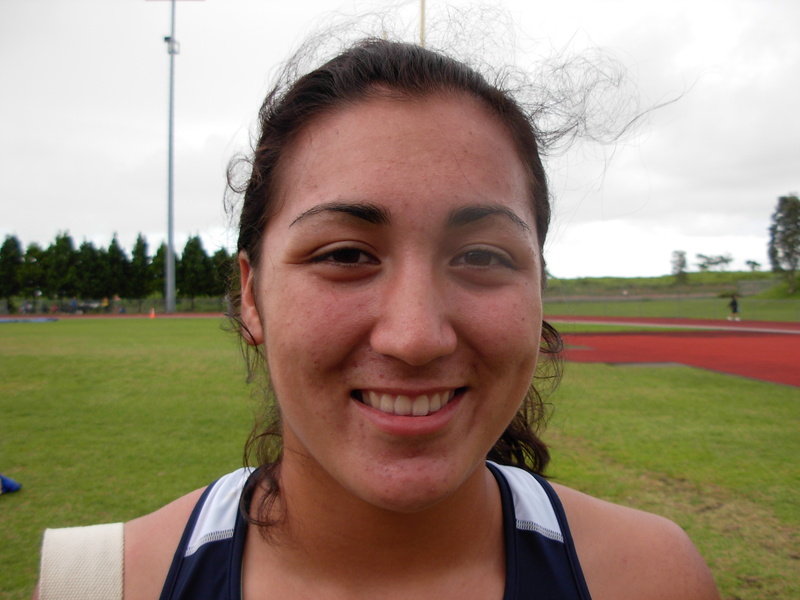 For the girls it was Kamehameha’s Kaopua Sutton’s impressive discus throw of 134’ 4” that gives her the No. 1 seed going into the finals. In the boys 800 Keaau’s Daniel Brooks opened with the second fastest time while the girls saw Waiakea’s Kaitlyn Chock qualify (#8) with her fastest time of the season. It was a tough day for BIIF athletes in the 100 and 200 meter dashes as league champion, Kana Silva, was disqualified in the 100, but came back to place #3 in the 200. 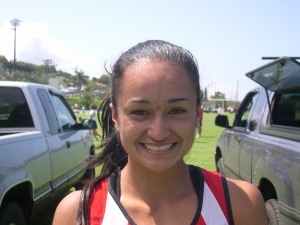 The lone BIIF girl in the sprint finals will be Waiakea’s Teisha Nacis (No. 7) in the 100. Waiakea’s Ka’imi Scott had a good showing in the 400 dash (No. 2) for the boys while Keaau’s Randi Estrada (#7) for the girls made finals. Estrada finished the third in the state last year as a freshman and is hoping to do the same again this year. “I know I need to run faster in the finals and I really like to get back to finishing in the top three,” she said. In the distance races it was Honokaa’s Athena Oldfather #5 and HPA’s Kela Vargas (#6) making finals in the 1500 meter run for the girls with Honokaa’s Chayse Moniz (#8) for the boys. 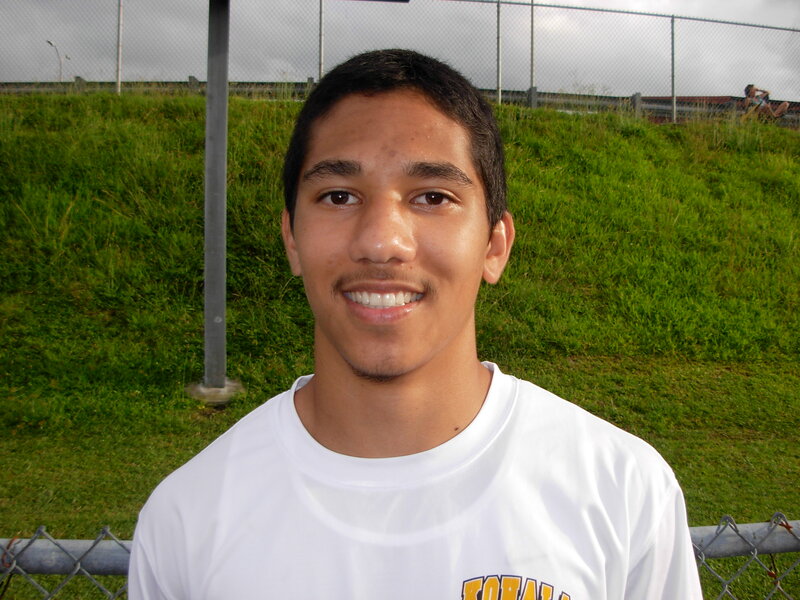 Distance hopeful, Honokaa’s Chris Mosch, scratched from the 3000 meter run with a stress fracture in his foot. The Dragon junior had the second fastest time in the state going into the prelims, but was forced to withdraw. Not all was rosy for BIIF relay teams as no island school made it into the finals of the 4×100 while the Keaau girls were eighth and Waiakea boys (No. 8 ) got in for the 4×400. 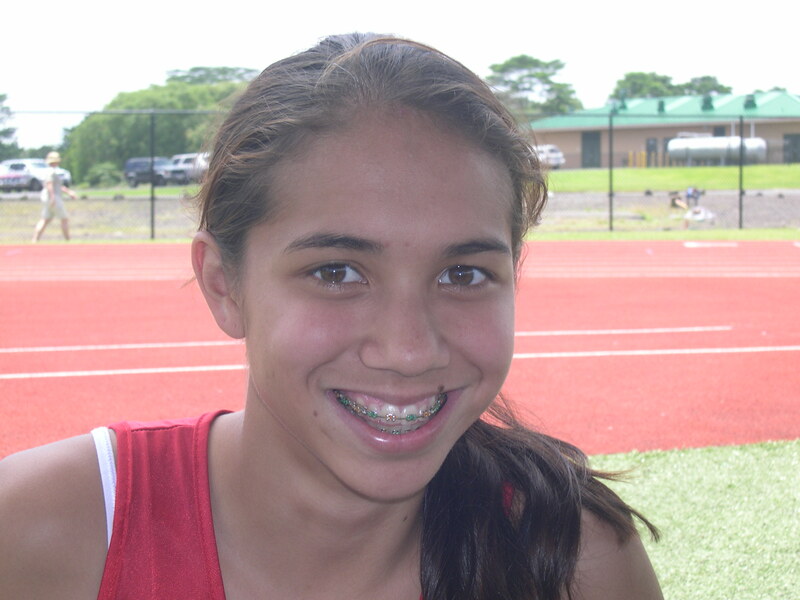 The girl’s high jump and boy’s pole vault were the only two events that held their finals on Friday as Waiakea’s Ericka Cushnie earned the BIIF’s first medal by taking second in the high jump, clearing 5’ 2”. 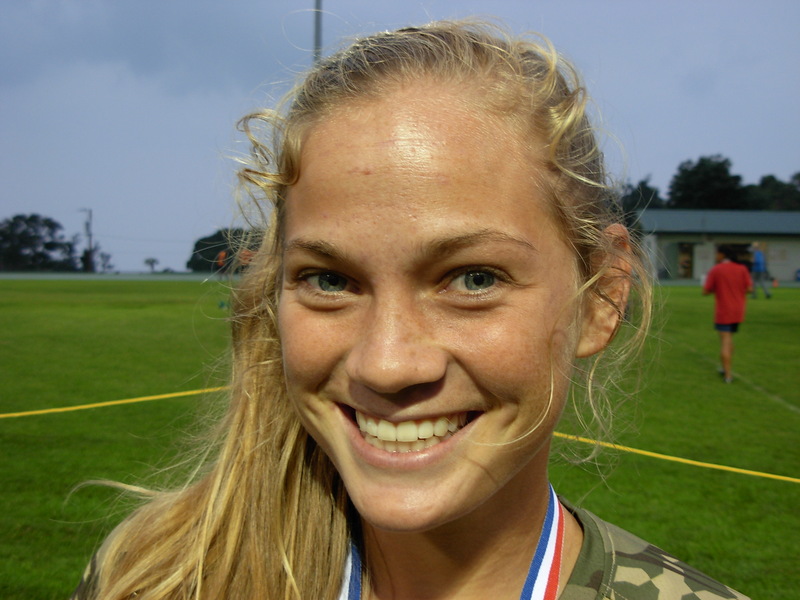 Defending state champion in the high jump, HPA’s Mindy Campbell, managed to clear 5 feet and took home the sixth place medal. The HHSAA championship finals will conclude today with 32 events with medals being award to the top 6 in each event. If things go as planned Big Island track & field athletes will need to carry extra luggage when then return from the state championships on Oahu this weekend as they will be carrying a lot of extra hardware with them. The Hawaii High School Athletic Association state track & field championships will be held May 14-15 at Kamehameha’s Oahu campus and the Big Island Interscholastic Federation will be looking to bring home medals in a variety of track and field events. Leading the way for the BIIF are state defending champions Kau’s Jacob Edwards and Hawaii Preparatory Academy’s Ku’uipo Nakoa. Edwards who has been billed as the “King of the Hurdles” has dominated both the 110 and 300 meter events and holds the best times in the state this season. To go along with his picture perfect hurdling Edwards also has the best distance in the state in the triple jump and could win gold in all three events. Nakoa, who single handily scored 58 points in helping HPA win the girls BIIF team title, also ranks as one of the top hurlers in the state. The senior Ka Makani is expected to fight for top honors in the 100 and 300 hurdles, but will face stiff opposition in the high hurdles from Kahuku’s Zhane Santiago. Santiago leads the state in the triple jump while Nakoa leads the state in the long jump going 18 feet earlier this season. Nakoa also has a good chance of medaling in both the 100 and 200 meter dash. Konawaena freshman, Ua Ruedy, has already made a name for herself in the 300 hurdles and on Oahu the youngster will focus entirely on that event as a gold or silver medal is within her reach. The fastest sprinter in the state this year is Punahou’s Ashley Satterwhite who has dominated the 100, 200 and 400 meter events. But Satterwhite has decided to forego the 400 dash to concentrate on the 100 and 200 leaving the door open to HPA’s Zoe Sims to compete for gold in the 400. Sims is the only BIIF girl to break the 60 second barrier in the 400 this season and if she goes under 59 seconds will have an excellent chance at taking top honors. Teammate Mindy Campbell is the defending state champion in the high jump and should also pick up a medal in that event. 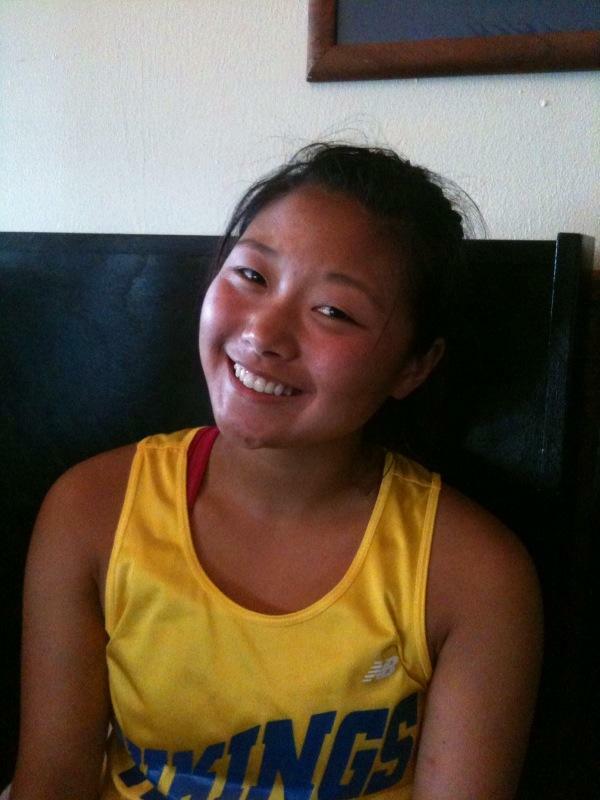 Hilo’s Shina Chung is ranked in a tie for second in the state in the pole vault, clearing a height of 10 feet 7 inches. Chung, just a sophomore, is the two time defending BIIF champion in the vault and has a good chance of breaking the 11 foot barrier which would put her in contention for the gold medal. BIIF girl’s team champions, Kamehameha, could also see Kaopua Sutton at discus and Victoria Evans-Bautista in the long jump claim medals in those events. The Punahou girls are the clear favorites to win the team championship as they have the depth and the “big point earner” in Ashley Satterwhite. 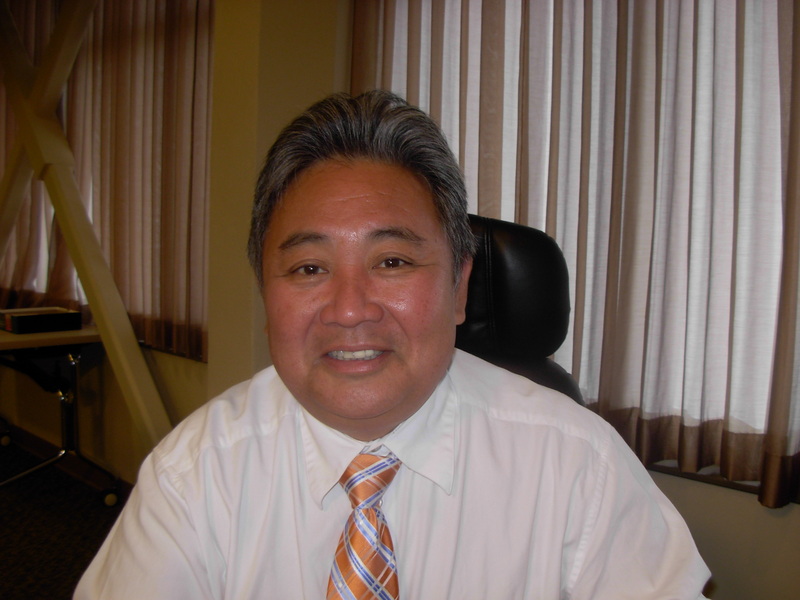 Lau believes that HPA has a shot of coming in the top five as a team. 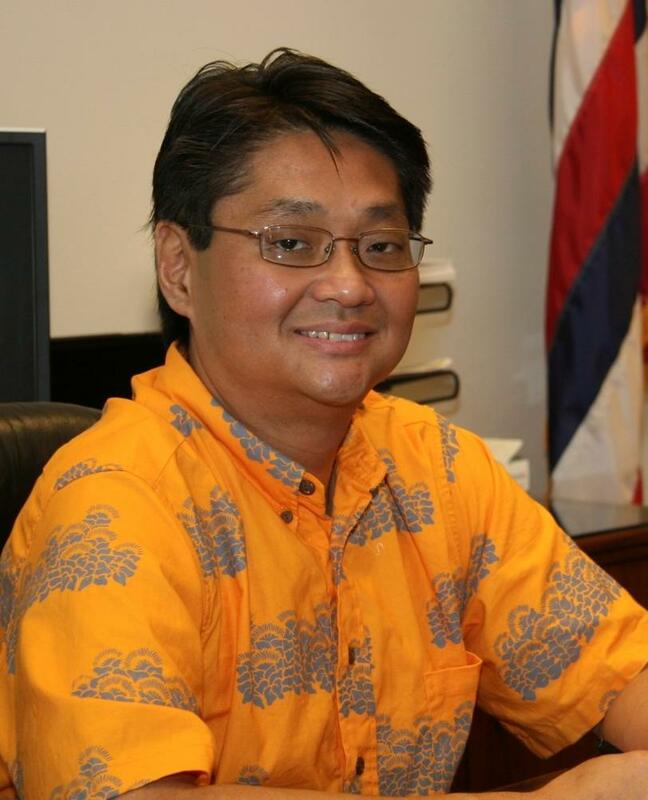 “The girl’s team title will be a fight between Punahou, Radford and Kahuku,” he said. While Edwards is the best hope for the BIIF boys to bring home gold a host of other talented Big Island athletes will be fighting to gain one of the top six medals presented in each event. Kamehameha coach Kimo Weaver sees his team’s depth as bringing them a long way this season. “At the state level we should be competitive in the relays, hurdles, sprints, jumps, throws and in the pole vault,” Weaver said. Kana Silva, Keanen Akau, Manta Dirks, Keli’I Kekuewa, Francis Blas, Maka McKee, and Isaac DeRego are the Warrior boy’s hopefuls to medal at the state, according to Weaver. 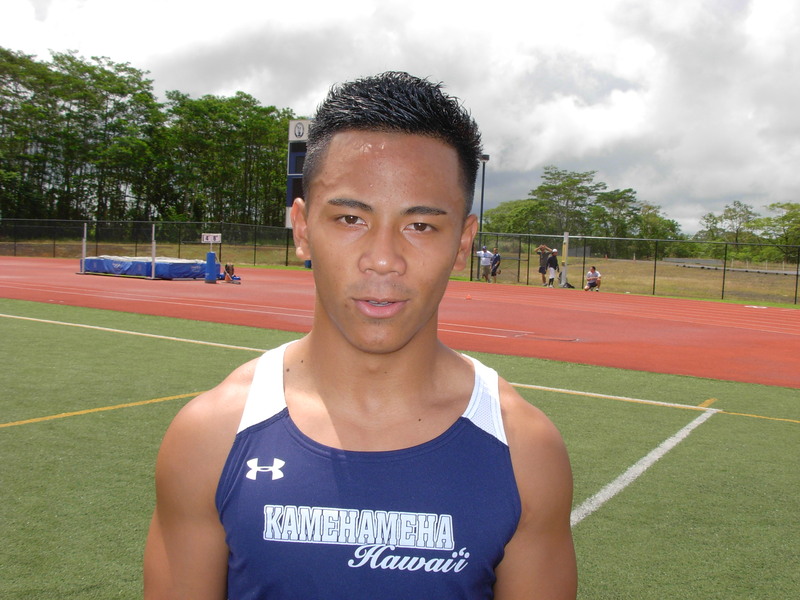 Also watch for Waiakea’s Ka’imi Scott in the 200 and 400 meter dashes as the two time BIIF defending champion in those events has the quickness and ability to get out of the blocks fast and maintain a lead. Kohala high jumpers Ethan Meikle and Kelson Kawai both cleared 6’ 4” during the BIIF championships which rank them in the top five in the state. Kamehameha’s Shane Brostek ranks third in the state for the shot put and Keaau’s Daniel Brooks third in the 800 meter run. A big question mark is whether or not Honokaa’s distance runner Chris Mosch will be fully recovered to run in the grueling 3K. Mosch hurt himself prior to last week’s BIIF championships and wasn’t able to compete. Should he be at full strength he would be the BIIF best hope to medal in that event. KEALAKEKUA – The Hawaii Preparatory Academy girls and Kamehameha boys are flying high after winning the Big Island Interscholastic Federation track & field team titles Saturday at Yates Field in Konawaena. HPA got a spectacular performance and 58 points from the “Queen of the Hurdles” Ku’uipo Nakoa. Nakoa, a state leader in the 100 and 300 hurdles, captured the BIIF individual crown in both events and also won the 100 and 200 dashes, along with the triple jump. Nakoa’s long jump second place finish, by half an inch, during the first event of the day ignited the senior Ka Makani to a near perfect performance. Kamehameha’s Victoria Evans Bautista saved her best jump for last leaping 17’ 3.75” to set a new meet record in edging out Nakoa for the long jump crown. Moments later Nakoa responded by winning the 100 meter hurdles and in the process set a new meet record in a blistering time of 15.16 seconds. Later in the day Nakoa won the 300 hurdles of 46 seconds flat also set a new championship meet record. 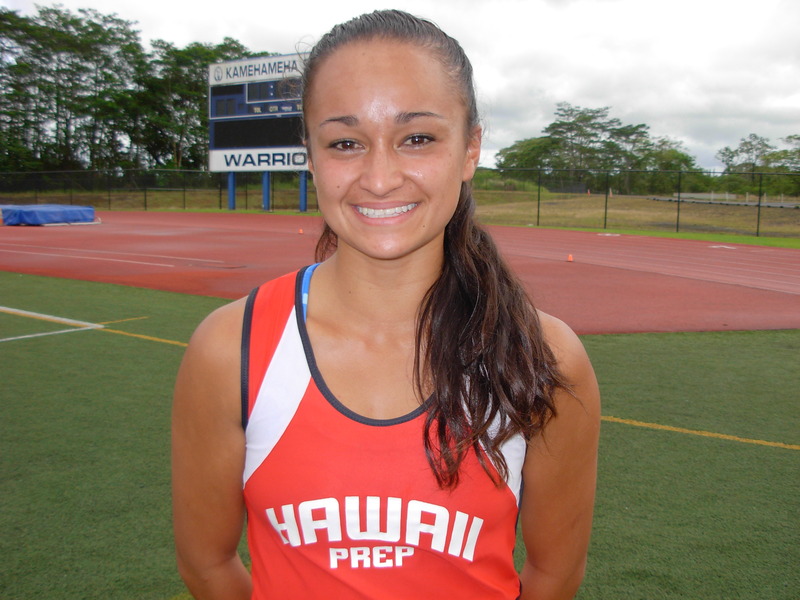 HPA also showcased another “Queen” in the hurdles, Lana Queen; running on the heels of Nakoa all season long Queen helped her team by placing second in the 100 hurdles and third in the 300. 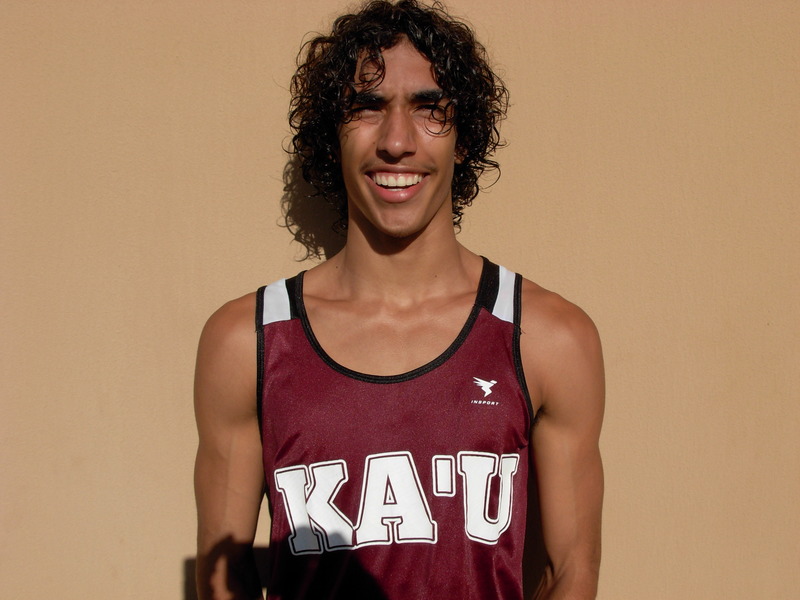 Ka Makani also gained points from middle distance runner Kela Vargas who finished fifth in the 800 and third in the 1500. The real surprise for HPA came from freshman Zoe Sims in the 400 dash when she ran the race of her life winning in 59.55 seconds. “I’ve only run the 400 a couple of times this season, but I really enjoy this distance,” Sims said. While Nakoa was tearing up the track with her blistering speed the Kamehameha boys were racking up points with their sprinters. Warrior Kanakalele Silva dominated the 100 and 200 meter dashes and provided the additional fire power to anchor the boys 4×100 relay team to victory. Silva was aided in the sprint department by teammates Kaenen Akau and Everett “Maka” McKee and Francis Blas III in scoring which propelled Kamehameha to the team title. 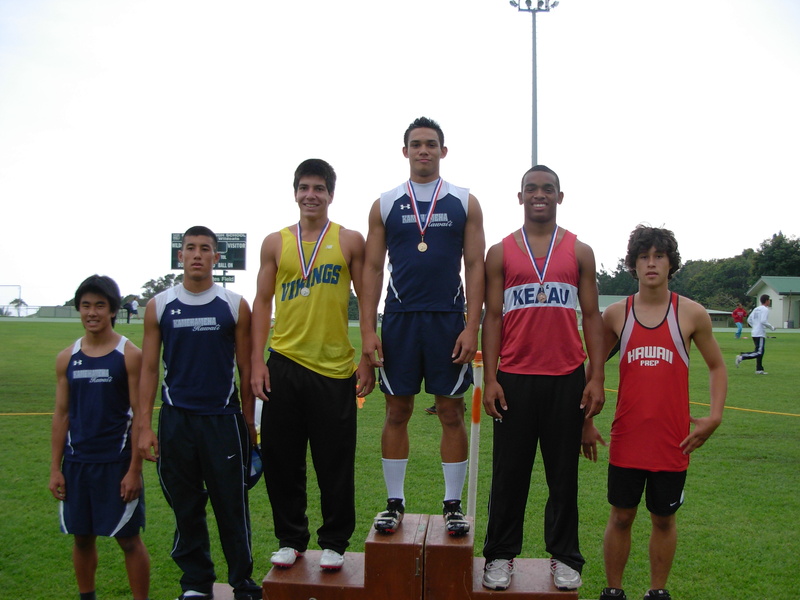 Blas, in the 110 hurdles, took advantage of Kau’s Jacob Edwards false start during the preliminaries on Friday by winning the finals. Akau, along with fellow Warrior Manta Dircks added points in the jumps with Akau winning the long, 21’ 5.5” and Dircks taking second. Dircks returned later to the jumping pit, taking second in the triple. Discus thrower David Kekuewa placed second in the finals and scored additional points by finishing second in the shot put with teammate Hawk Hanoa taking third to round out the major scoring efforts for the Warrior boys. In the finals of the boy’s pole vault, held on Friday, Warriors Isaac DeRego and Max Shimamoto went one-two respectively to aid 18 points to the team count. 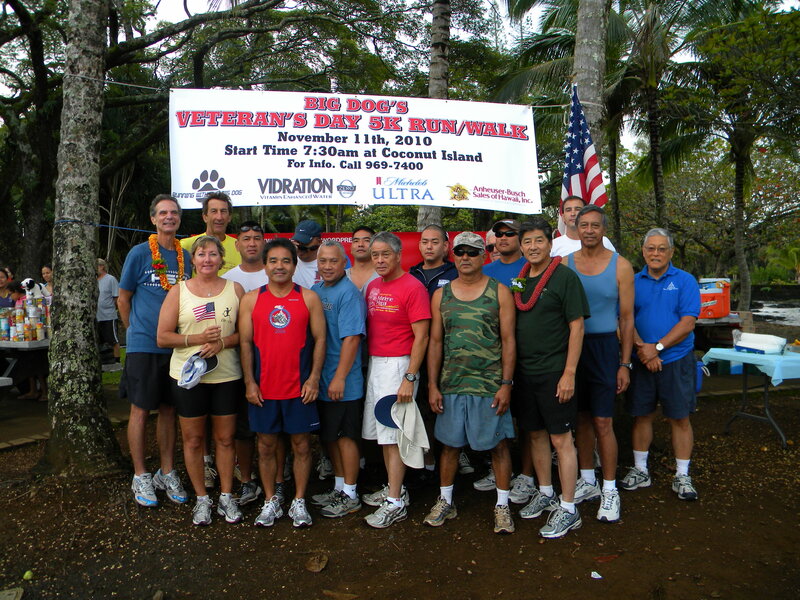 Last season it was Hilo winning the boys team title with Kamehameha edging out HPA by two points for the girls crown. This season Ka Makani runners and jumpers left little doubt on reclaiming the BIIF crown beating runner up Kamehameha girls by more than 40 points. A total of eight BIIF championship records were set, according to track official, Bob Martin.